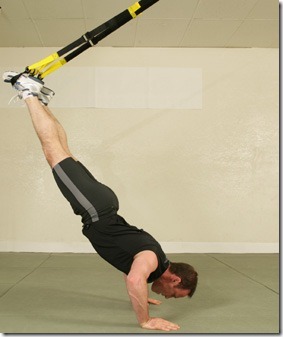 TRX suspension training: a 2 pound contraption made of low tech straps. It can replace an entire gym. The resistance is provided by the body weight of the trainee, and can be easily adjusted by simply changing the angle the person pulls at. TRX almost always uses the important but rarely trained core muscles, the lower back, stomach and oblique muscles. Unlike weight machines, TRX exercises (like push-ups with hand in the straps) also train the small muscles that stabilize joints. 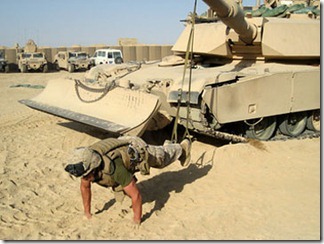 TRX became first popular in the US armed forces. 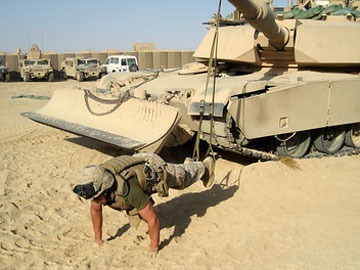 It is hard to carry a fully equipped gym to war in Iraq. A few straps are not only easier to carry around but also a lot cheaper. Exercise straps? Is Human-Stupidity changing this blog’s topic? No. Human-Stupidity is about fixed ideas, dogmas, mental restrictions, and about overcoming such limitations. elastic tapes are needed. This requires us to have various straps of differing strength, that also can snap and injure the trainee. To be fair, Wikipedia quotes a few predecessors of TRX Suspension Training, but seemingly they were never successful enough to become famous. 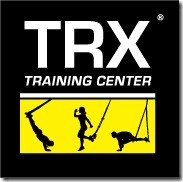 You have to watch a few pictures, a few movies, and then try yourself to understand the genius simplicity of TRX. You can even carry TRX on a business trip and mount it on hour hotel room door. You can carry it to the park and strap it to a tree. 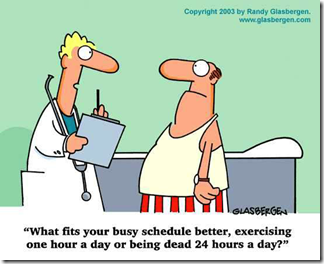 No more excuses for not exercising. Suspension training requires placing your feet in stirrups suspended from straps attached to a thick branch or metal bar and exercise hanging upside down. Makers of the two most popular devices (TRX and Inkaflexx) claim there are more than 300 strengthening and toning moves – from knee-tucks to push-ups – that can be performed in this dangling position and it is said to work every part of the body. 2002, when a Navy Seal turned entrepreneur sent Mr. Baldwin a test model of the TRX system, a suspension gadget made of a pair of straps with handles joined by a metal clasp ring. To set it up, he only had to wrap the straps around a freestanding pole or over a thick branch. Strength training became as simple as placing his feet in stirrups to suspend them off the ground, then performing dozens of exercises like knee tucks or pushups. After 45 minutes of so-called suspension training, Mr. Baldwin exhausted his body from shoulders to calves using just the 170 pounds of his weight. Better yet, the two-pound straps rolled up to the size of a military bag lunch. In the last year suspension training has entered the mainstream after two kinds of straps landed on the market: TRX and Inkaflexx. They have attracted the attention of personal trainers and group fitness directors as strengthening tools that also improve balance and flexibility. Suspension workouts consist of either hanging the legs or leaning back while gripping the straps and then performing a variety of moves. We think the critics are talking about the hard-core exercises being dangerous for couch potatoes. The lighter exercises shown above don’t look dangerous. Out-of-shape people can not indiscriminately use all exercises meant for elite Navy Seals. Hello everyone. 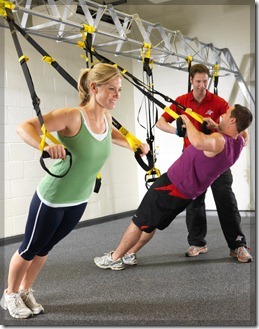 Yes the TRX Suspension Trainer Pro Pack is a very powerful workout system. You can get your own for only $159.99 + free shipping at trxbodyweighttrainer.info during the holiday sale. Previous Previous post: Human logic evolved to win arguments, not to find the truth, scholars assert.